When it comes to gardening, I’ll admit it here and now, I’m in it for the food. 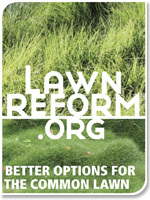 My front yard is one large vegetable garden with a few square feet of lawn around the periphery for contrast. I grow the usual suspects here in southeastern Connecticut: tomatoes, peppers, peas… you know the drill. But I’m also a sucker for the unusual, and I’ll try anything once. This has resulted in some interesting horticultural experiments over the years; some successful and some less than successful. For example, last year I decided to try growing my own lupini. You Rhode Islanders know what I’m talking about—those pickled yellow bean things served at Christmastime in Italian homes… the ones you pop out of their skins to eat. Now I don’t know if it was just our terrible, horrible, very bad summer last year or if lupini are just not suited to New England, but this was one experiment that went sadly awry. I had a few stunted plants, a couple of sorry little flowers, and no beans. Which is just as well, really, considering that lupini in their raw state are basically inedible, and must be repeatedly soaked and rinsed before being fit for human consumption, and I don’t know that I would have been all that enthusiastic about so much extra work in the middle of canning season. But as it turned out, I didn’t have to worry. This year, I have a three fairly unusual vegetable varieties I plan to try. First up is Capucijners Blue Podded Pea. I saw these growing in the herb garden at the Cloisters in New York last summer on a Master Gardener-sponsored bus trip, and fell in love at first sight. Gorgeous, aren’t they? 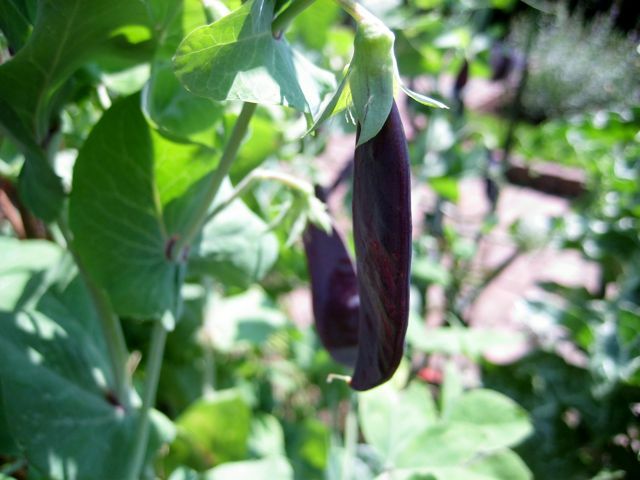 They can be eaten very young as snow peas or fully mature and dried as soup peas. I had to hunt around for the seed, and finally found it at Amishland Heirloom Seeds in Lancaster County Pennsylvania. According to their website, the company was started by a graduate of the Pennsylvania Master Gardener Program. Besides blue-podded peas, they also carry white cucumbers, Japanese melons, and a root vegetable called skirret. I am so going to visit this website again next year! 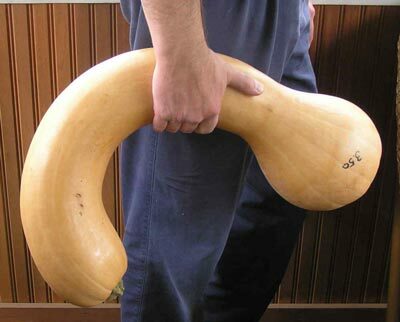 Looks like a butternut squash on steroids, doesn’t it? I got this seed from the very nice, very generous Daniel Gasteiger, who blogs at SmallKitchenGarden.net. He bought one last fall and offered seeds to his readers, and being the adventurous gardener that I am, I jumped at the offer. Daniel also gardens in Amish country in Pennsylvania, and apparently these wild-looking squash are common in that area, and also go by the name Pennsylvania Crookneck Squash. You can read Daniel’s post about them here. Neck Pumpkins are mainly used for pie-making. Can’t wait! Greasys are so prized in the mountain south that an Appalachian bride’s trousseau would traditionally have included a few seeds from her family’s unique strain of beans. Such devoted guardianship has produced an unmatched diversity of greasy beans in the North Carolina and Kentucky highlands, with more than 30 known varieties still cultivated on small patches of mountain land. I found White Greasy Bean seed at a website called Cherry Gal Heirloom Seeds. They’re also one of the sources of seed I found for a dye garden project I’m working on, but that’s another post. I never got to try lupinis! Are they like edemame in a way? I just picture popping them out of the pod. Why “neck” squash? Are you supposed to hang them on your neck? I’m not trying anything too unusual – just some new heirloom tomatoes (there are so many to try). New for me will be beans for drying and black eyed peas. I also got obsessed with fruit this winter and bought some highbush blueberries, red and yellow raspberries and a lingonberry (this I’m very excited about). You might try http://www.seedsofitaly.com. They carry a lot of unusuals. thanks herbdoc! that’s where i got the lupini seed last year, i think, but they stopped carrying it due to lack of interest. I checked a few other sources and had no luck, but will keep an eye out for them.